to suspend most instrumental rehearsals in the spring term and focus on learning The Armed Man. All the music staff who would normally take rehearsals came to direct and/or sing. Corinne Cook took the lead initially and then Andrew Penny started to direct as the performance drew near. off! Again, in true Hymers spirit, all the choir and orchestra made it (the exceptions being a few guests who had to travel a long distance). if we could keep up this level of concentration the performance really could be something very special indeed. Tea time came and the snow was still falling, with more forecast. There were real worries about the safety of the event now, but, having come this far, we were determined to do the performance as we had all invested so much time, not to mention money, into this event. away it was spell binding. Images pertinent for each movement appeared on the screen and the whole meaning of each movement was conveyed beautifully. In over 30 years of involvement with school performances, I have never experienced anything quite like it. 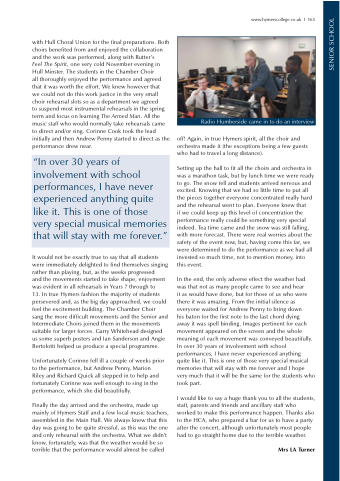 This is one of those very special musical memories that will stay with me forever and I hope very much that it will be the same for the students who took part. I would like to say a huge thank you to all the students, staff, parents and friends and ancillary staff who worked to make this performance happen. Thanks also to the HCA, who prepared a bar for us to have a party after the concert, although unfortunately most people had to go straight home due to the terrible weather. 13. In true Hymers fashion the majority of students persevered and, as the big day approached, we could feel the excitement building. The Chamber Choir sang the more difficult movements and the Senior and Intermediate Choirs joined them in the movements suitable for larger forces. Garry Whitehead designed us some superb posters and Ian Sanderson and Angie Bertolotti helped us produce a special programme. Unfortunately Corinne fell ill a couple of weeks prior to the performance, but Andrew Penny, Marion Riley and Richard Quick all stepped in to help and fortunately Corinne was well enough to sing in the performance, which she did beautifully.